Let’s Play (Dr Pepper Snapple Group) and Good Sports are encouraging schools and nonprofit organizations to submit photos of their old, worn-out sports equipment for the chance to win grants for brand-new gear. Three deserving organizations will receive new sporting equipment thanks to a Let’s Play contest sponsored by Dr Pepper Snapple in partnership with Good Sports. Let’s Play, a community partnership led by Dr Pepper Snapple Group, is teaming up with Good Sports to award $35,000 worth of new sports equipment to deserving organizations across the country through the Let’s Play Before and After Contest. Now in its second year, the Let’s Play Before and After Contest is open for submissions through April 3, 2016. 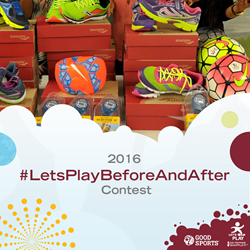 To participate in the contest, schools or nonprofits that serve youth and are in need of new sports equipment may upload a photo of their old, worn-out equipment to the Let’s Play Facebook page using the hashtag, #LetsPlayBeforeandAfter. The organization’s name must be included in the submission as well as a short description of why new sports equipment is needed. At the end of the two-week submission period, entrants will be narrowed down to 10 finalists. Visitors to the Let’s Play Facebook page will be able to vote daily for one finalist from April 11 to April 17, 2016. The organization with the most votes at the end of the voting period will receive a $20,000 grant of new sports equipment. Second place and third place will receive $10,000 and $5,000 sports equipment grants, respectively. “There are so many organizations that struggle to sustain sports and active play programs because equipment runs its course and it’s often too expensive to replace. As part of our partnership with Good Sports, we are excited to offer the Let’s Play Before and After Contest as a way to get more kids back in the game each and every day,” said Vicki Draughn, vice president of corporate affairs at Dr Pepper Snapple Group. Through its Let’s Play initiative, Dr Pepper Snapple has committed $3 million over three years to help Good Sports provide sports equipment to youth-serving organizations across the U.S. Winners of the Let’s Play Before and After Contest will be officially notified by representatives from Dr Pepper Snapple Group and Good Sports following the conclusion of the contest on April 17, 2016. For full Official Rules, please visit http://www.letsplay.com/socialcontestrules.